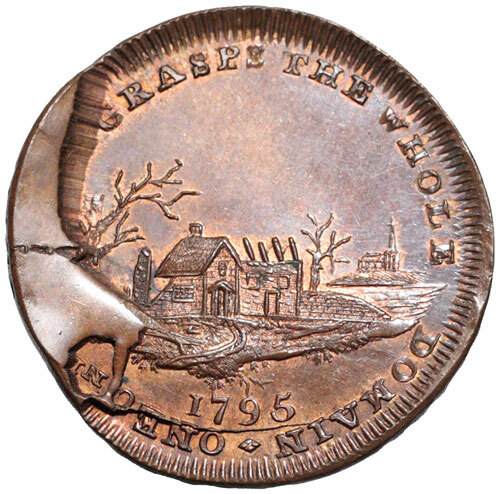 The story of the late 18th century copper tokens and coinage is as much a story of historic changes in minting technology as it is of the new coinage coming from Boulton and Birmingham and the extensive issue of tokens that inspired James Conder to be the first to issue a catalog of a non-currency minting. No small part of the history of this era is the minting technology itself. Solving the challenges of good quality flans, finely designed dies that could endure hard use, and mechanization of the minting process revolutionized coinage. These years mark the conclusion of a search that was true for early American coinage as well as for the British series. Copper issues from the late 1700s provide a hands-on demonstration of the problems attacked and, by early in the 1800s, evidence of the success of those efforts. During this era dies would break but minters would often continue using them until they were too shattered to use any longer. The authors of Grading Guide for Early American Coppers (EAC 2014) discuss the growing trend among collectors of early American copper to collect by die state. They reference a 1998 work on half cents by Ron Manley illustrating twenty different states from his detailed study of an 1804 half cent. Die state collecting has joined die variety collecting to become a popular aspect of early American copper collecting. A committed subset of collectors of the D&H token series has taken up the challenge as well. Several points come to mind: some die conditions are more rare than others, particularly if your goal is to have high grade pieces in your collection; the muling of dies in a series such as Spence’s suggests the sequence in which the various mules were made but it also means that the scarcity of some of the varieties results in difficulty in representing that phase of the die deterioration; some catalogers—particularly in the past—rate pieces with die breaks as less desirable and one cannot help but wonder whether some pieces have been discarded or at least set aside in the past. Collecting a die deterioration sequence can be a long-term venture. There is always that hope that you will run across another piece that fits in somewhere. The Deserted Village set assembled by Wayne Anderson in the mid 1990s, for example, ends with a piece labeled “terminal die state” but a photo we have of a piece (D&H 746, below) from the 1998 Noble sale shows even more serious deterioration. We published Anderson’s die progression set of D&H 744 to 749 in a 1996 publication introducing the 18th century token series. Wayne was a highly enthusiastic late 20th century collector who sought exceptional quality material, and also carefully assembled a group of eight examples of the obverse of the Deserted Village halfpenny token. This set is offered as lot 361. Each of the six reverses is represented once in the group but for the Cain and Abel reverse, which is represented three times in succession at an intermediate point in the series. This, by the way, suggests that the striking of the various mules was probably done just one time in the life of the die rather than at various times. The legend, ONE ONLY MASTER GRASPS THE WHOLE DOMAIN is a line from Oliver Goldsmith’s classic poem “The Deserted Village.” The poem refers to General Robert Napier whose purchase of a large tract of land in 1730 included the village of Lissoy. He ejected the tenants, many of whom moved to America. Goldsmith and Spence were both highly critical of this forced displacement. The collector who consigned this fascinating set back to us after having purchased it from us long ago has also consigned another die progression set, eight examples of Kempson’s London Building series (D&H 64) showing the Ordnance Office in Old Palace Yard, purchased from Cliff Fellage, a 1990s specialist in the token series. Both lots of eight pieces represent a fascinating progression as well as a great start for a project to find more die states. Manley found 20 for his half cent study. The Deserted Village set clearly offers more stages to seek, and there are other so far as yet unpublished prospects to be found in the D&H series.